Braces (which are professionally known as orthodontic appliances) are devices used by the dentist to straighten crooked teeth. 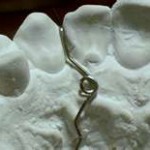 There are generally 2 types of braces, fixed and removable. Usually, most of the braces users are wearing fixed braces, which are wires and brackets. However, if the severity of the crooked teeth is mild or the patient is still at a growing age, they can have removable braces. There are many types of removable braces, and they are different from retainers and functional appliances. Some people may confuse these appliances as they can all be taken out from the mouth. Retainers are appliances that are worn after wearing braces for a period of time, and they do not cause tooth movement, unlike braces. As the name suggests, retainers only hold the tooth that are already moved in place. Therefore, if a patient is not compliant and does not wear their retainers after their orthodontic treatment, they will find that their teeth will become crooked again, and the effort beforehand will be wasted. While functional appliances are braces that are given to children between seven to eleven years old. This is because children at this age are still growing, therefore, these appliances can help with the growth of the jaws and also correct the crooked teeth. Removable braces are made up from 3 components, which are the active components, retentive components, and the baseplate. There are various types of active and retentive components, and different combination of those components will produce different types of removable braces. Sometimes, in a single removable braces, there will be two types of active components to achieve 2 different types of tooth movements. The period needed for the treatment to be completed depends on the severity of the crooked teeth, the patient’s compliance, and a lot of other factors. Active components are responsible for producing tooth movements through something that is known as activation. Different types of active components are activated through different ways. A few types of active components are springs, bows, expansion screws, and elastics. Retentive components are needed to hold the braces in place, and give stability. A few types of retentive components are C clasp, Adam’s clasp and Southend clasp. The baseplate is the plate that holds all the components together. It comes in various colours, but mostly they are pink (to mimic the colour of the gums) or translucent for aesthetic purposes. The baseplate is also able to provide extra retention to the removable braces, as they come in contact with the large surface of the palate. However, at each activation, some modifications have to be made to the baseplate to prevent unwanted tooth movements. One of the removable appliances is known as the Hawley’s appliances. It has a labial bow (active component) and Adam’s clasps (retentive component). This appliance is usually used when the upper front teeth is protruding too much. The bow will pull the front teeth inwards, and the clasp will be clamping on the back teeth to give retention to the appliance and strength to the active components. Hawley’s appliances can also be used as a retainer when necessary, with some modifications made to it. Another removable appliance is known as the Z spring, which is used to push a tooth outward. This appliance is relatively simple and discreet, as it consists of only a Z spring (active component) and retentive components. As the clasp is only placed at the back teeth, and the Z spring is placed behind the tooth which is to be pushed, virtually nothing can be seen from the front. There is one type of removable braces is a relatively new technology, with the name invisalign. This braces is rapidly gaining popularity, because it is translucent, which works in favour for the majority. Patients, especially teenagers, usually don’t like fixed braces because they are very obvious. Other than that, fixed braces are also painful to wear, and often cause ulcers in the early stage. They also need a lot of adaptation as they are bulky, and require very thorough cleaning. However, the end results and the effects of fixed braces are quite good, and they have their own benefits which invisalign cannot provide. For more information on invisalign, please refer to http://www.invisalign.com.sg/Pages/Home.php. No matter what types of braces that you think may suit you, it is important for you to consult with an orthodontist as they are specially trained in this field. It is also important to maintain good oral hygiene throughout the orthodontic treatment period and also the cleanliness of the appliances, as bad hygiene can cause tooth decay, which will worsen and further complicate the treatment.